One of the newest updates of Notepad++ has introduced new, quite annoying Edit with Notepad++, item added to many context menus. Since, there isn’t an option in Notepad++ itself, to remove it, you have to solve the problem yourself, by unregistering one of Notepad++ services. Start cmd.exe to start command line. Type cd "Program Files (x86)Notepad++"
Type regsvr32 /u NppShell_06.dll (see notes below). Type exit to close command line. Hit Ctrl + Alt + Del and click Start Task Manager. Go to Processes tab, locate explorer.exe process, select it, hit Del and confirm. Click File > New Task (Run...), enter explorer.exe and hit Enter. 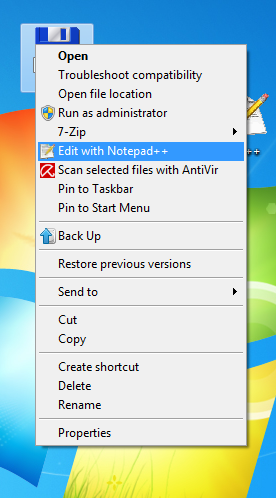 Adjust path in point 2., if you have 32-bit version of Windows or installed Notepad++ in different folder. The NppShell_06.dll file is correct file name for currently most recent version of Notepad++ (6.6.9, updated today). Ajust this filename, if you have newer version and NppShell_06.dll file is not found. If you’ll need to revert above operation, you can reinstall the extension, by following above steps, but executing regsvr32 /i NppShell_06.dll instead (the only difference is in /i switch, which stands for installing service). If, for some reasons, you don’t want mess up with system services, there are other solutions to this problem. This blog post isn’t an exact duplicate of this Super User answer. This is mine own edit to mentioned text. The original answer is way shorter in details. Unfortunately, Chris, original author of this answer, has no idea about SE community being able to change someone’s answer or question, and completely ruined my answer. So, I keep this copy, as a reference for me. but ‘edit in notepad++’ is still in the context menu. Sorry, but this solution was meant to and was tested under Windows 7 only. Either recent change in Notepad++ or Windows 10-specific problem. I find Windows 10 a disaster and complete mistake and I’m not going to migrate to it until forced to. Thus, don’t expect anything for this version of Windows in this blog, sorry.